Death Valley National Park is a harsh place. It is the hottest location on Earth and has held the record for highest recorded temperature since 1913. The park is also the driest and lowest spot in North America. 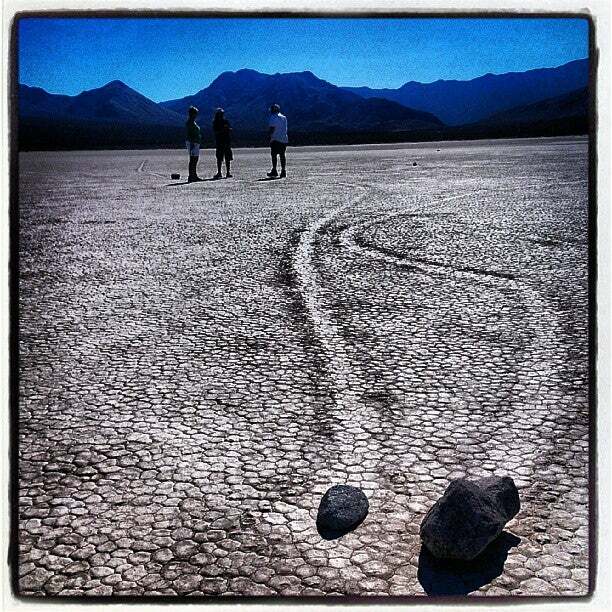 However, despite its ominous name, Death Valley is an adventurous, fun place to take the kids. With a healthy dose of planning and preparation, families can spend an enjoyable weekend exploring this one-of-a-kind natural wonder. Death Valley National Park feels like it’s worlds away from the nearest big city, Las Vegas. The park may not offer a vast array of accommodation options, but that feeling of isolation is part of Death Valley’s charm. Families can camp at one of the park’s campgrounds, most of which operate on a first come, first served basis, but for families who prefer comfortable beds to sleeping bags, the park does offer a few hotel options. Furnace Creek Ranch is a family-friendly property located near Death Valley’s golf course and visitor center. Kids will appreciate the hotel’s swimming pool after a day of hiking. Another affordable option is Stovepipe Wells Village, located deeper within the park near the popular Mesquite Flat Sand Dunes. Stovepipe Wells Village consists of a motel, restaurant, saloon, general store, and swimming pool, making it a convenient place to stay for families who want to be near modern amenities. Panamint Springs Resort is an ideal choice for those who want to venture to the western side of the park. The resort offers views of sand dunes and the Panamint Mountains. Guests can opt for a stay at the hotel, campgrounds, or RV park. Although its location is somewhat remote, Panamint Springs does offer an on-site general store, restaurant, and gas station. When hiking at Death Valley, it’s important to use caution and arrive prepared with plenty of drinking water, sunscreen, snacks, and a good map. A popular hike at Death Valley is Mosaic Canyon, which takes visitors through a narrow canyon, part of which is lined with smooth, white marble. This hike is fairly level, although it does require kids to do some rock scrambling, making it a great excursion for families with older children. If you’re not in the mood for a hike, there is still plenty to do at Death Valley. Families can drive the winding road to Dante’s View, a beautiful scenic overlook. Another popular overlook is Zabriskie Point, located along Highway 190 near the park’s eastern entrance. Before you leave the park, there are two spots that you’ll want to visit with your camera in hand. The Mesquite Flat Sand Dunes offer visitors the chance to explore a unique sand-filled landscape. Inquire at the park’s visitor center about ranger-led stargazing programs that are often held at the dunes. Another must-visit spot at Death Valley National Park is Badwater Basin, the lowest point in North America. Believe it or not, there are dining options within Death Valley National Park. At Furnace Creek, visitors will find a casual restaurant, Forty-Niner Café, which serves American classics like burgers and chicken tenders. After your meal, be sure to check out the nearby Borax Museum. Another casual dining option can be found at Stovepipe Wells’ Toll Road Restaurant, located behind the hotel. Here, guests can enjoy a buffet breakfast or a sit-down dinner. Hours are limited, so consider giving them a call before your trip. Those traveling to Death Valley from Las Vegas will find plenty of options in the nearby town of Pahrump, located near the halfway point of the drive. Pahrump is home to family-friendly restaurants including Ohjah Japanese Steakhouse, Mom’s Family Diner, and My Thai. Experts weigh in on how to make the most of your Yellowstone vacation. Experience Yosemite's best with this travel guide.